Sophie Thiele, student of English Literatures at Humboldt University Berlin, gives us a very personal account of this week’s public reading, a cooperation between the Literary Field Kaleidoscope and the Centre for British Studies in Berlin. 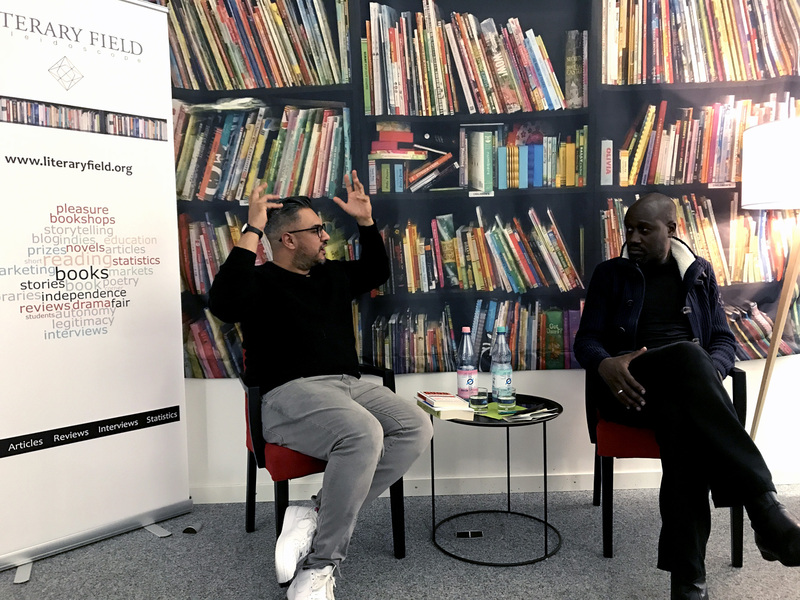 This Tuesday, the Literary Field Kaleidoscope together with the Centre for British Studies hosted Nikesh Shukla and Musa Okwonga for a reading and discussion about the brilliant essay collection The Good Immigrant, edited by Nikesh Shukla himself and with contributions by both authors. The event left me amused, speechless and inspired. These two multi-talented writers impressed me immensely and this evening, I am sure, will resonate with me for a while. Even though it was meant to be a reading, audience participation was strongly encouraged so the reading part was reduced to a minimum. 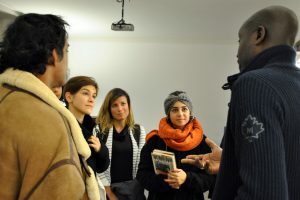 Musa guided the lively discussions professionally but light-hearted. In a conversation in which Spider Man and food featured next to racism and cultural appropriation, it soon became clear that all these things are connected and relevant. Language, for example, as Nikesh highlighted in the short reading from his essay “Namaste”, is extremely important. When terms are robbed of their meaning and context, people can get hurt. Unbalanced power relations have a huge effect on the use and reception of language and cultural practices. Some of the examples discussed in this framework were cultural festivals like Holy celebrations in different (Western) countries and practices such as wearing a Bindi. Cultural appropriation is highly problematic, however, the conversational tone of the discussion, so well guided by Musa as well as Niskesh, did not create a feeling of being lectured. It felt more like listening to a conversation among friends, which made the addressed topics so much more accessible. Musa and Nikesh also created a cheerful atmosphere by talking about things that are not necessarily related to the topics and experiences examined in The Good Immigrant. Musa, after praising Nikesh’s work (see also our blog from 3 Nov), asked him questions about a variety of things, e.g. his relationship to social media. He said “I enjoyed Twitter until last June [when the Brexit vote happened]”. Another interesting answer was given with regards to the music he is listening to: “You come to the age of 35 and you stop discovering new music”. He is, thus, revisiting older songs, among his tips are Outcast and the song Millionaire by Kelis, which I am listening to while I am writing this. Thanks Nikesh for this excellent music tip! (link to the official video on youtube) Food was another aspect in the discussion and Nikesh told an anecdote about how he had cooked (and burned) his mother’s dishes shortly after she died in order to recreate the smells and tastes of his childhood. Finally, Musa asked Niskesh about the books he is reading and Nikesh admitted that he was not well read for the first bit of his life, but has since then developed an interesting reading list of writers of colour. You can find some of the books he mentioned at the bottom of the post. All these personal anecdotes made clear that race relations are not the only topic they wanted to discuss this evening. As various writers of the collection also claimed, the two authors wanted to highlight that they should not be reduced to their looks and ethnicity and always be filed into certain categories. Additionally, these conversations made this evening so enjoyable and the two authors so likeable. The questions from the audience, spanning from the publishing process of the collection with the publisher Unbound to the issue of misappropriation, were extremely lively. One question on the problematic term ‘reverse racism’ provoked a reply from Musa that was as insightful as moving. Musa identified racism as not merely cases of discrimination but a whole system based on unequal power structures, a strategy to dehumanize a group of people to maintain the imbalance. He also said that one does not have to be a ‘bad person’ in order to show racist behaviour: “good people can do bad things”. Still, he was expressing his optimism by stating that “if we can acknowledge that there is a problem, then there is hope for change”. These two outstanding authors, even in times of Brexit (boo!) and a rise in racist attacks, are able to remain optimistic and communicated this positivity to their audience. Even though or maybe because the topics discussed ranged from such different themes (how often are Spider Man and Chinua Achebe mentioned side by side in one evening? ), I gained insights into contemporary everyday-life in Britain, related and unrelated to race issues and made me see problems of race and racial injustices in a different light. I hope to be able to communicate about these topics in a more positive, open-minded way in the future, inspired by Nikesh’s and Musa’s so relatable conversations. 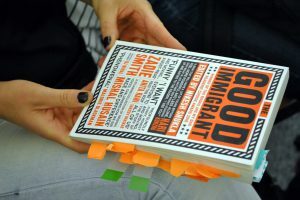 I am convinced that The Good Immigrant should be on all reading lists – and apparently, the GBZ started with its current students. 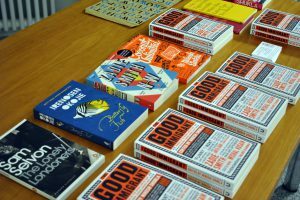 Nikesh has kicked off an amazing process with The Good Immigrant and empowered and inspired a large number of authors and readers. Now he is off to new tasks, including his day job, caring for his family, publishing a new novel very soon (The One Who Wrote Destiny – sounds extremely interesting!) and seemingly a million other projects in his pipeline. I cannot wait to hear more from this amazing author.